This fanciful, one-of-a kind home surfs the edge of the shore! Giant windows look out over wild open ocean to Monhegan Island and beyond. One of the most desirable spots on one of New Harbor/Pemaquid Point's most exclusive and private shorelines. Hidden away off a dirt road, verdant pine and sea-salt perfumed grounds overlook ocean bluffs (w/ ample lawn for kids to play catch!). Below, your own expansive wonderland of rocky ocean front boasts immense tidal pools, a freshwater stream and flat ledges for sunning or seating your very own lobster cookout! Inside, 'Seachange' is open, light and airy with intriguing peaks and angles and two-story windows front and back. A magnificent rock fireplace opens to the living and dining/kitchen areas. A large screened porch (with convenient pass-through window) is the perfect place to eat, read, and relax. Watch lobster boats pull in their traps, observe the copious wildlife that populates the shore and sea, and let the sounds of the surf lull you to sleep in the hammock. A winterized 'wing' of the house has separate bath, efficiency kitchen, work desk and sleeping areas affording very private separation from main house. The living room offers expansive, 180-degree ocean views from seating around the coffee table---perfect for a cocktail-hour gathering, and equally inviting for an afternoon siesta or snuggling by the fire with a book. The open kitchen and dining room look out over a fresh-water stream that babbles through the pine forest just behind the house. The dining table expands to seat 10. A pass-through window from the dining/kitchen area to the screened porch is handy for serving blueberry pancake breakfasts. On the porch you can enjoy a cup of coffee while watching the lobster boats bring in their haul. A 'prow'-like sun deck opens off the screened porch and juts out over the shoreline. Climb winding stairs to a master bedroom with queen bed that affords a crow's nest view from Yellowhead to the Seal Ledges and out to Monhegan Island. Write postcards (or, okay, check your email) at the built-in desk area. Behind the master bedroom is a lovely, shady bedroom (two twin beds) overlooking treetops and the freshwater creek. Tucked under the eaves is a snug bathroom with tub/shower and skylight. The attached apartment wing (with a separate outdoor entrance but also accessible to the interior of the main house) houses a sleeping area with twin beds and a sitting area with a full-sized sleeper sofa, separated by a stone chimney with wood stove. It also features a built-in desk area, bath with shower, washer and dryer, kitchenette with sink, full-sized refrigerator, microwave oven, and toaster oven. This private retreat is perfect for guests, a couple wishing extra privacy, or those with restricted mobility. The house has a furnace to take the chill off early spring and fall mornings… and the 'small change' apartment is 'winterized' with a wood stove and electric heaters. AMENITIES: Seachange has a fully equipped main kitchen (open to dining and living room) plus a separate bar/prep kitchen with 2nd refrigerator and sink in attached wing. Washer and dryer, microwave, toaster, toaster oven, coffeemaker, 3 telephones, fans (including ceiling fan), cable TV/VCR, WIFI internet, CD/tape player, portable dehumidifier, charcoal grill, lobster cookout equipment. ACTIVITIES: There's plenty to do at Seachange. You can explore the coastal tide pools, birdwatch, sunbathe on the rock ledges, play catch on the lawn, or fish right off the docks or walk down to nearby picturesque Back Cove, or bike the adjacent roads and trails. 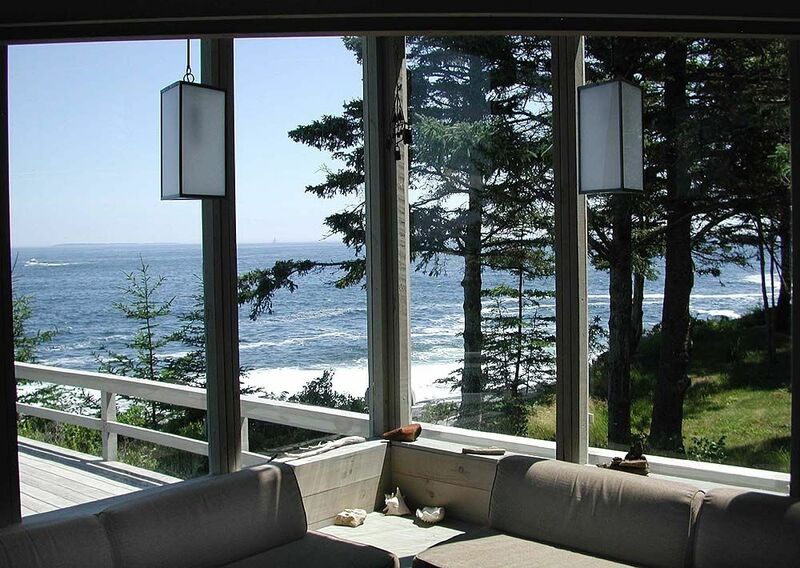 Or, simply relax on the porch, and appreciate the sounds and sights of the ocean. AREA: The New Harbor/Pemaquid area offers great hiking, sea kayaking, boating, boat cruises, antiquing, historic sites (Fort William Henry, Colonial Pemaquid Restoration in immediate area) and many fine restaurants. Public golf course nearby. Pemaquid Lighthouse Park and Pemaquid Beach (sand) are located within a short drive or bike ride. Short drives to Damariscotta, South Bristol, Round Pound and Christmas Cove. Day trips to Monhegan Island out of New Harbor. Seachange (the main house) has a fully furnished kitchen. Smallchange, the self-contained attached cottage, has a kitchenette, with full-size refrigerator, microwave, sink, and toaster oven. Wireless and cable broadband internet service. Surf the web and get your email from anywhere in the house. Sea Change is most interesting architecturally and is set very near the open Atlantic with a fantastic view. Perfect setting for watching lobster boats and the many sea birds. Unfortunately, we did not enjoy our stay and left early. The major issue was that we came at the end of October and encountered a multi-day Nor'Easter. No matter how much we ran the furnace and fired up the fireplace we could not get the heat over 65F! The cottage, with its large single paned windows and lack of insulation, was obviously was not comfortable in such cold and windy weather. However, it would be a totally different story in the summer. Also, if you are not aware of what the open ocean is like in a storm be prepared for lots of thundering and crashing from waves on the rocks. My wife was not bothered but I found it relentlessly noisy! Not the cottage's fault at all but inlanders might be in for a surprise if they are looking for quiet. In spite of the issues encountered, the management company and owners were extremely co-operative and understanding from first contact until our premature leaving. We definitely don't recommend renting end of season unless you're prepared for adventure! Maine weather in May or October especially can be hit or miss. (Please note, however, that the back third of the house-- the extension we call "Small Change" IS in fact insulated). We had a wonderful getaway stay at Sea Change. The photos don't lie, this cottage has an unusual and interesting design, is very comfortable and private. The coastal view is spectacular. While it is on a quiet road, there is easy access to a good grocery store, ice cream shop, art galleries, and several restaurants.We took advantage of local tourist spots including the Pemaquid Lighthouse and the Rachel Carson Preserve. We stayed at this amazing place for a week last year. Views are not to be believed! (except when the fog rolls in-- but that has its own romance). And love this house! Its like a ship on the ocean... and the grounds around the house are totally wild and enchanting. Lush grass (gotta get back to that hammock-- practically hangs over the ocean! ), flowers, pine trees, a babbling brook. Amazing. But falling asleep to the sound and smells of the surf is probably what i miss that the most. The kids loved exploring the rocks and tide pools. There's even a tiny fresh water "swimming hole" down there, if you can take the freezing water (I can't, but the kids loved it). Magical spot. When I first drove up to Sea Change, I couldn't believe the spectacular view. I immediately called to see if I could stay longer. Inside is clean, cozy and comfortable. The living room has sweeping views of the sea. The fireplace is huge. We used it every night. The beds are comfortable and the kitchen was well stocked. We grilled out frequently and spent lots of time sitting on the deck or exploring tide pools. It was wonderful going to sleep ever night to the sound of the ocean. We loved it! I've already booked it for 2013! Sea Change is a delightful and comfortable property in every way. For those who enjoy the sights and sounds of crashing waves and playful sea birds, and brilliant star gazing , this is the place. It is also an architecturally interesting house with views in every direction.From the dining room table you can watch the birds in the forest or look out to the bay. There is everything one needs in the way of kitchen appliances and utensils as well as a selection of books, lots of local information, and comfortable furniture. The deck, screened in porch , and perfectly positioned hammock add wonderful places to sit and view the scenery or read. The location is perfect for going in a few minutes by car to Reilly’s Grocery Store for anything one could possibly need. The delicious freshly baked muffins each morning at Reilly’s make it a great destination for a walk too. Other nearby walks include a beautiful one around Back Cove. We highly recommend a stay at Sea Change and are looking forward to our next week there this summer. 10 mins to Golf; Under an hour to Boothbay Harbor, Rockland, Rockport, Camden, Port Clyde and Tenants Harbor. $1750-2250/Week Check-In Time is 3:00 p.m. Check-out is 10:00 a.m. Sheets and towels are not included with this rental. There is a rental service for linens you can inquire about. One dog considered with additional $100.00 Fee with owners' approval.